Learning French, like any other new language, implies a lot of memorization, and often, as adults, our memory is not what it used to be. These 12 tips will help you memorize new information longer, and learn French more efficiently. Written French and spoken French are almost 2 different languages. There are many silent letters, glidings, liaisons etc… and they are everywhere, including in French verb conjugations and grammar. For more info, read my article on why you should always Learn French with audio. Even when studying grammar, playing the audio will help you tremendously as you are going through the lesson. Picking the right audio tool though is essential: a French beginner will be discouraged with a French movie. At that stage, French movies should be seen as a recreation, not a serious study tool. Picking the right French audiobook is your first challenge, and from your choice may very well depend the success or failure of your French studies. Do you need to write? or do you need to listen? or do you need to read to learn things by heart? Whatever the method you are using to learn French, make sure you adapt it to YOUR learning style. 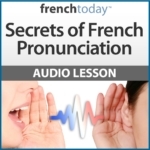 This being said, studying French with audio is a must if you want to learn French to communicate: understand spoken French and speak French yourself. When it comes to learning languages, not everybody is the same. I’ve taught hundreds of students, and I can tell you from experience that some people have an easier time with languages than others. It’s not fair, and it’s not popular to say it… but it’s true. It doesn’t mean that someone less gifted cannot learn French, but it means that self studying is not for everybody. Some students need the expertise of a teacher to guide them through their studies, motivate them and find creative ways to explain the same point until it is understood. Skype and/or phone French lessons can be a good solution. On this topic, you may be interested in my article on how to select the best learning method and avoid scams. When you are a total beginner, some translation is going to occur but try as much as possible to avoid it. Translating adds a huge step in the process of speaking (“Idea –> English –> French” versus just “idea –>French”). It makes your brain waste time and energy, and will fool you into making a mistake when literal translation doesn’t work. So if you don’t translate, what should you do? Try as much as possible to link the new French vocabulary to images, situations, feelings and NOT to English words. “Brrrr” = “I am cold” = so….je… then être in je form…. je suis froid – oh yes but wait, the French don’t use “I am” for that one… they use “I have cold” = ” so avoir… so j’ai = so j’ai froid…. It is MUCH simpler and faster to link the feeling of cold or “brrrr” = “j’ai froid”. If you are doing flashcards to study French – which I strongly encourage you do – draw the word/situation whenever possible instead of writing English. Even if you are not a good artist, you’ll remember what your drawing meant, and it’s much more efficient to learn French this way. This is exactly why you should be particularly careful with cognates – words that are the same between the two languages. Furthermore, cognates always have a different pronunciation, and your English brain is going to fight saying that word the French way. I hear many students having a hard time with the word “chocolat”. In French, the ch is soft, as in “shave”, and the final t is silent. Shocola. Most French students pronounce it “tchocolaT”. Finally, there are many false cognates: words that exist in both languages but don’t have the same meanings (like bras in English (underwear) and bras in French (arm). So, cognates need more of your attention, not less. Learn the new French vocabulary in a sentence. Like that you will learn “in context”, you’ll remember the situation and words longer, and you’ll already have a series of words that go well together handy for your next French conversation! 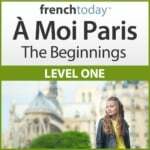 To learn French in context, I highly recommend you check out my unique downloadable French audiobooks, featuring different speeds of recording and enunciation, and focussing on today’s modern glided pronunciation. Let’s say your teacher told you to write some sentences for homework – or maybe let’s imagine you are doing French flashcards. You want to learn “the black dog” in French. Instead of writing down “Le chien est noir”, look for a black dog you personally know, and write: “le chien de Peter est noir, Fluffy est noir”. (Peter’s dog is black, Fluffy is black). Your brain will remember a sentence describing a truth or a memory much longer than it will remember a sentence of made up facts. This is the same idea as the concept of learning French in context. Use larger flashcards and on the same flashcard, write all related French vocabulary as you come across it. You’ll get to the info faster if you have memorised it all together. Often, to make learning more fun, we try to present a text, a story. At least I do, as much as possible. If your memory is great, go ahead and memorize everything! But if it’s not the case, PRIORITIZE: what words in this story are YOU likely to use? Focus on learning these first, then revisit the story once you’ve mastered your first list. The same logic applies to tenses: in conversation, most of the time we use the present indicative. So focus on the present when studying your French verb conjugations, and then move on to adjectives, essential vocabulary, asking questions, pronouns… things that will make an immediate difference in your ability to converse in French. The French subjunctive can wait! 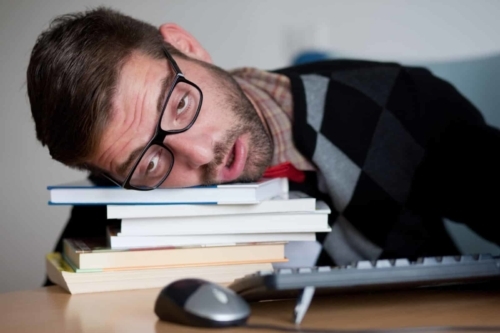 If you study French all afternoon, chances are that you’ll exhaust yourself, and are much more likely to get frustrated, lose your motivation or attention. Spending 15 minutes a day learning French – not multitasking but with 100% of your attention – will get you better results than two hours during the weekend with the kids playing in the background. 1. Review – Repetition is the Key! This is probably the number one mistake students make. They concentrate on learning new material, and forget to review the older one. Rule of thumb: for each hour spending learning new things, you need to spend minimum one hour reviewing older things. I hope these tips will help you conquer the French language. I post new articles every week, so make sure you subscribe to the French Today newsletter – or follow me on Facebook, Twitter and Pinterest.